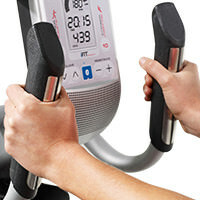 Top Features Hybrid Trainer Pro Get Started on Your Transformation If you’re craving a total-body elliptical workout, step aboard the Hybrid Trainer Pro. And when you’re ready for a comfortable and effective recumbent bike workou.. 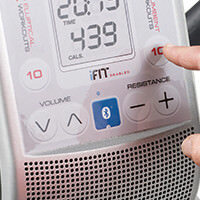 If you’re craving a total-body elliptical workout, step aboard the Hybrid Trainer Pro. And when you’re ready for a comfortable and effective recumbent bike workout, simply adjust the pedals and console. In a matter of seconds you can switch between two high-quality machines—at one incredible price. Built with the best in fitness technology, the Hybrid Trainer Pro is compatible with iFit® technology (subscription required) for unlimited workouts and workout programming designed by top TV trainers like Chris and Heidi Powell. No matter your goal, you’ll find programs created just for you. If you need a little motivation, check out the iFit® Google Maps™ routes. You’ll be able to work out at any destination in the world, then follow along via Street View thanks to the integrated tablet holder. You couldn’t ask for a better workout, a better price, or a better fitness solution. Enjoy long, full strides with this generous 17-inch stride length. When you step on the pedals of a ProForm hybrid trainer, you get instant access to professional training programs fully loaded and ready to go. Now you can enjoy a challenging workout focused on your goals. Just press “Start” and you’re off. Step into comfort with our deluxe cushioned pedals. 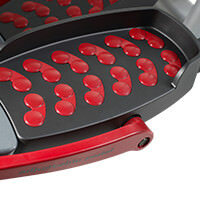 Now you can find the perfect foot position for you while enjoying excellent traction control. Protect your investment with a Lifetime Frame Warranty and 1-Year Parts & Labor Warranty. Please note: Lifetime Warranty pertains to the lifetime of the original purchaser. Get a total-body, low-impact workout with upper-body workout arms. 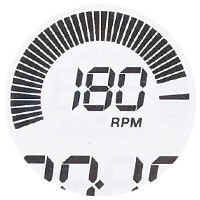 Elliptical training engages your entire body with each step. We’ve learned that the best fitness experience is all about the details. With the Hybrid Trainer Pro, you aren’t just working out, you’re enjoying a comfortable ride. Our oversized seat has added cushioning and easily adjusts so you find the perfect fit. Stay hydrated throughout your workout by keeping your water bottle close. This convenient water bottle holder is built-in to the frame for easy access. This elliptical accommodates up to 350 pounds.